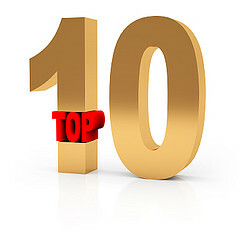 In a blog post earlier in the week, I took a look at My Personal Top 10 Favorite Blog Posts in 2010. In this post, I will list the top 10 blog posts in 2010 on the Rich Christian, Poor Christian blog according to pageview traffic analytics. Let me qualify this list by saying that some of these posts were written prior to 2010, but they still received a lot of pageviews in this year. 10. 10 Money Mindsets and Attitudes. I wrote this post near the beginning of 2010 and it still receives a considerable amount of pageviews. In this post, I discuss ten different money mindsets such as ignorance, apathy, materialism, and abundance. This is a thought-provoking post to see where you line up in how you think about money. 9. How I Paid Off Over $25,000 of Debt in 18 Months. Here is another post that I wrote at the beginning of the year that still receives a good deal of traffic. In this post, I give my readers the six steps that I went through in order to pay off $25,000 worth of debt in 18 months. These steps included the following: Inspiration, Determination, Separation, Perspiration, Celebration, and Continuation. 8. 10 Influential Christians to Follow. This is an older post from way back in 2009, almost a year and a half old, that continues to receive a number of pageviews. At the time of its writing, I list ten Christians who have had an impact on my life, including such people as Dave Ramsey, Dan Miller, Rick Warren, and Greg Vaughn. 7. Success is a journey, not a destination. In this post, I take a look at how the world defines success, and then how John Maxwell defines success in his book The Success Journey . Ultimately, success is about knowing your purpose in life, growing to reach your maximum potential, and sowing seeds that benefit others. 6. Giving While Getting Out of Debt. In this post, I address the issue of whether or not a Christian should tithe while trying to dig their way out of debt. This was in response to reading a Christian finance book that was very non-committal about the whole concept. At the end of the argument, God did not cause you to go into debt. You caused you to go into debt. God has expectations that we will live a life of generosity. He will bless us as we seek to give back a portion of what He has blessed us with. I would contend that you will get out of debt faster through giving back to Him. God will bless you in amazing ways as you seek to take a Biblical approach in your money matters. 5. 7 Relationship priorities. Here's another 2009 post that I wrote over a year and a half ago that continues to receive considerable traffic. In this post, I list seven relationships that should be a priority in our lives including God, ourselves, spouses, children, parents, friends, and professional relationships. 4. Pride | A Sin God Hates. In this post, I provide examples from Scripture of people who struggled with the sin of pride and God's response. I concluded the post with a three-step remedy for pride: reliance on the Lord, embrace humility, and repent immediately. 3. Equipped to do God's Will | Spiritual Gifts Inventory. I wrote this particular post near the beginning of 2010, and comes in at the number three spot. God has equipped each believer with specific gifts and abilities for a specific purpose in His Kingdom plan. In this post, I provide links to online tools in order to assess your spiritual gifts through inventory questionnaires. 2. Giving testimonies. Written back in 2009, this is a very brief post where I list out eight online resources for giving testimonies. I continue to receive a lot of traffic on this one. 1. Creating your personal mission statement. And finally, this post comes in at the #1 position for my most popular post this year. I wrote it back in 2009, and it still continues to receive a lot of pageviews. This is a "meaty" post which gives you a great starting point in crafting your own mission statement. I talk about what should be included in your mission statement. I list seven book resources to help you in your quest to write out your mission statement. Finally, I give you some ideas on the actual process of sitting down to put in the hard work of writing everything down on paper.